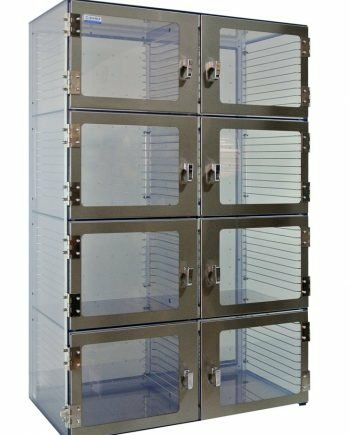 1500 series desiccators are single and multi-chamber cabinets designed for storing humidity-sensitive samples products, and electronics in a clean, dry and oxygen-free environment. When used in conjunction with a nitrogen purge control unit or any inert gas purging, you can control relative humidity and oxygen level down to 1% and eliminate the oxygen-related degradation of samples. ¼’’ Thick Transparent Static-Dissipative PVC. Interior walls are static dissipative except the removable back plenum panel, which is non-dissipative PVC. The material has a slight grey tint and is chemically resistant to most common corrosive agents. Ideal for applications that use common cleaning agents. Eliminates static charges and keeps the dry box clean since it does not attract particles from the air. Surface resistivity of 106 – 108 ohms per square. Provides for ESD control without the need for ionization. A grounding system for electrostatic discharge. Stainless steel door frame and door hinge. Chrome plated wire rack for shelving. A pair of wire racks is needed for each chamber and are optional if there are no shelves. Shelf Space (Usable Area) W"xD"
Overall Dimension W" x D" x H"
One-Channel Automatic Purge Control Unit (PCU) with one humidity sensor. Epoxy powder coated steel stand with caster (including two locking). Available in 30'' and 35'' height with an optional upgrade to leveling mounts. Cam lock with an option to have the same or different key for each door. Please note that the price for the cam lock is per door. Stainless steel locking bracket for use with a padlock. Please note that the price for the locking bracket is per door. Stainless steel bottom plate installed on the bottom of each chamber. The back plenum can be removed for applications that require isolated chambers. 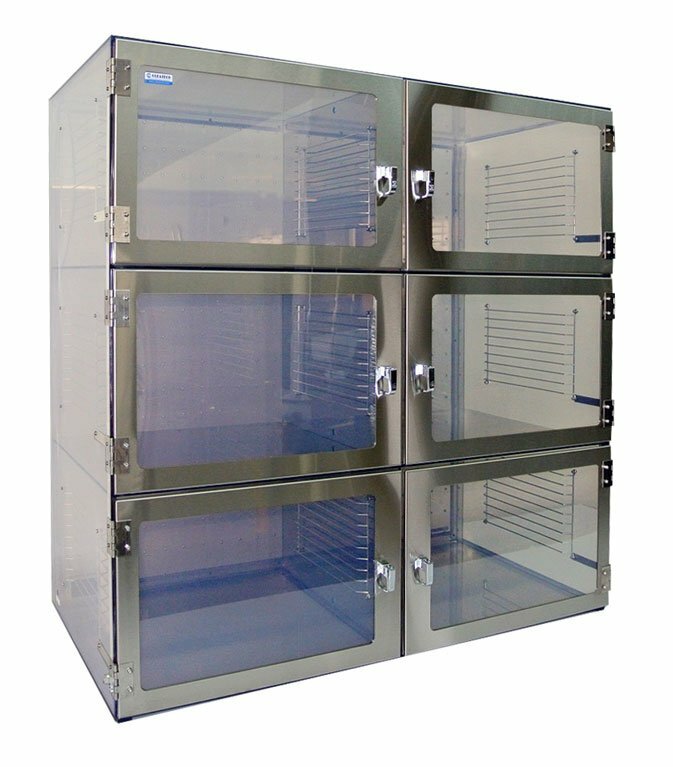 See all available models and accessories of Cleatech Desiccator cabinets. Compare the many design and fabrication features that make Cleatech desiccators the most efficient and durable cabinets available. Download the desiccator cabinet datasheet in PDF. 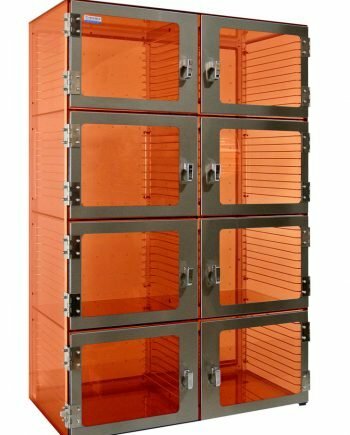 The 1500 series desiccators are multi-chamber storage cabinets with a capability of nitrogen purging. A general guide specifying the differences between the types of desiccators we carry.